Bums come in all shapes and sizes. They can be spotty or stripy, red or wrinkly, wooly or even round and wobbly. Who has what type of bum? Lift the flaps and find out. A very fun book for little ones. 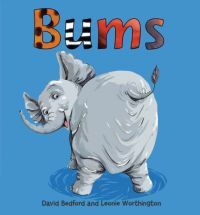 If you are comfortable with the use of the word bum your little ones will probably love this book just because of it.The text is simple, only one sentence across the two pages and is paired with colourful, friendly looking illustrations. Young readers will also like the interaction of lifting the flaps.